IT'S EVEN EASIER TO GET OUR SHOWS ON ANY DEVICE AND ANY WAY YOU WANT THEM! You can subscribe to ALL our shows in iTunes or just get the one you are most interested in. Plus you can choose between the audio only (like a podcast) or video versions of the shows! The shows are free (as is iTunes). So no excuses ok? But to "pay me back"... while you're there don't forget to comment and rate the show. (cough) 5 Stars (cough). You can also use your favorite player/tablet/phone or service to access all our shows by using our RSS FEED links. We will be joining more podcast networks soon ... so stay tuned! Click the images or buttons below to subscribe to the feed of your choice! Or email me with any questions. THIS IS THE AUDIO ONLY VERSION OF ALL OUR SHOWS! You will get every new show we do right away! THIS IS THE VIDEO ONLY VERSION OF ALL OUR SHOWS! You will get every new show we do right away! DON'T WANT ALL OUR SHOWS? THEN SUBSCRIBE TO JUST THE AUDIO PODCASTS YOU WANT BELOW! 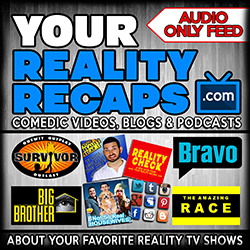 THIS IS THE AUDIO ONLY VERSION OF OUR AMAZING RACE SHOWS! You will only get Amazing Race shows! THIS IS THE AUDIO ONLY VERSION OF OUR SURVIVOR SHOWS! You will only get our Survivor shows here! THIS IS THE AUDIO ONLY VERSION OF OUR BRAVO TV SHOWS! You will only get our BravoTV shows here! THIS IS THE AUDIO ONLY VERSION OF OUR REALITY CHECK SHOW! 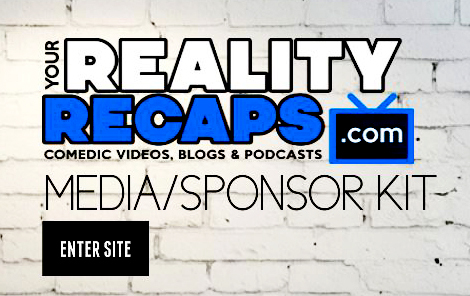 You will only get our Reality Check show! THIS IS THE AUDIO ONLY VERSION OF OUR OPPOSITE WORLDS SHOW! You'll only get the OW show here! THIS IS THE AUDIO ONLY VERSION OF OUR BIG BROTHER SHOWS! You will only get our Big Brother shows here! THIS IS THE AUDIO ONLY VERSION OF ME READING THE BRAVOTV REAL HOUSEWIVES BLOGS TO YOU! DON'T WANT ALL OUR SHOWS? THEN SUBSCRIBE TO JUST THE VIDEO VERSIONS YOU WANT BELOW! THIS IS THE VIDEO ONLY VERSION OF OUR AMAZING RACE SHOWS! You will only get Amazing Race shows! THIS IS THE VIDEO ONLY VERSION OF OUR SURVIVOR SHOWS! You will only get our Survivor shows here! THIS IS THE VIDEO ONLY VERSION OF OUR BRAVO TV SHOWS! You will only get our BravoTV shows here! THIS IS THE VIDEO ONLY VERSION OF OUR REALITY CHECK SHOW! You will only get our Reality Check show! THIS IS THE VIDEO ONLY VERSION OF OUR OPPOSITE WORLDS SHOW! You'll only get the OW show here! THIS IS THE VIDEO ONLY VERSION OF OUR BIG BROTHER SHOWS! You will only get our Big Brother shows here!